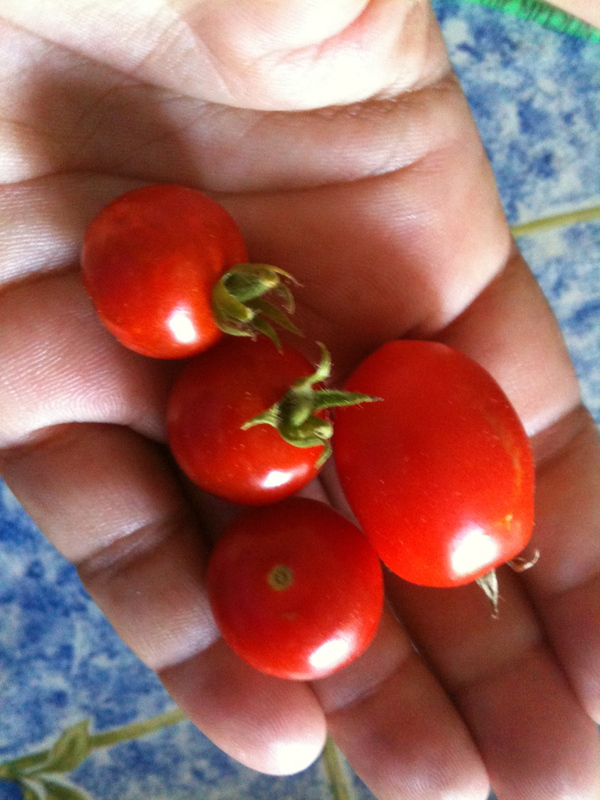 My tomatoes are starting to turn red (or yellow depending on the variety) and, although none have made it into the pot yet I’m pleased with my small harvest. We’re well into the 90s here in Austin already, and yet I’m getting fruit instead of the sad brown withered stalks I had the past two years. I think it has to do with my new rain barrels. I bought them from a local vendor I met at the Zilker festival this year. Very nice guys (they are *not* paying me to say any of this) and I like how the rig looks *and* works! I really felt bad for my potted plants during the past 2 years of drought. I couldn’t very well *not* water, but the city water left a salty looking rime in the pots… rather makes one wonder what is really coming out of that tap! 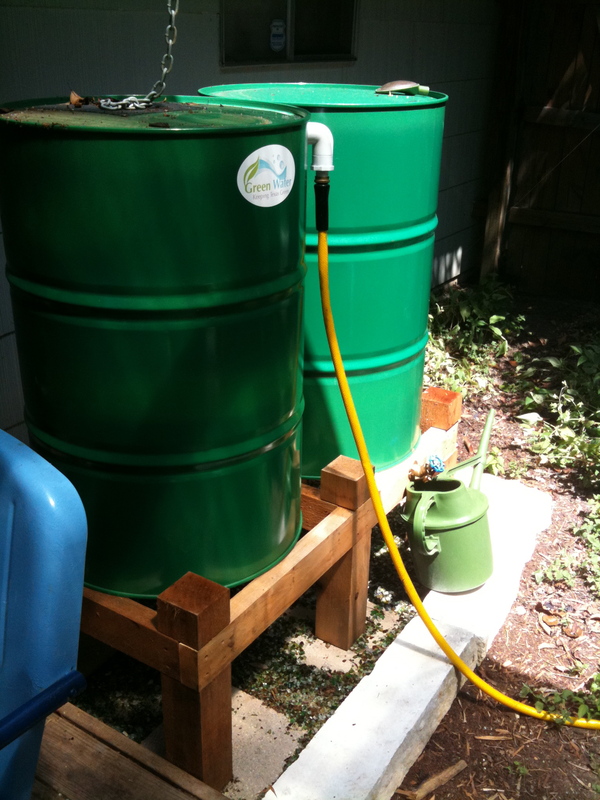 While I know that rain harvesting is not at all a new concept, I heard a surprising amount of negatives from folks around here, mostly gripes about the difficulty of actually getting the water out again to use it, or about the skeeters using the barrels as family sized hot tubs. No trouble on either of these fronts yet. I’m very happy with my set up, from the ground up. and they match the house! Underneath the barrels I put 3 layers of heavy landscape cloth, then I put pavers for the “legs” to stand on (the legs are 4×4 cedar… should last a good long time) and I filled in around the pavers with broken glass. Austin will *give* you slightly tumbled broken glass from the recycling program! Most of it is brown (beer bottles) or green (wine bottles) or clear, but there is the occasional bit of blue or some other interesting color. I’ve run my hands through the stuff and not gotten cut! The glass looks nasty when you pick it up out near the landfill. There’s a mountain of it and you bring your own container and shovel. If you just need a little, like the washtub I filled, its free. If you want a pick-up truck load its about $10. What a deal! Once you wash it off it sparkles like gemstones. It makes a dandy mulch or path or… (I have an idea. If it works I’ll post it ). So, the point of all this is that my tomatoes are happy this year. Also my citrus and herbs. I only water the stuff in containers and so far there’s been enough water for everyone. Oh, and the overflow (that yellow hose) goes off to my fig tree, and boy is it happy this year too! a *very* small harvest, but its a start! If I get enough tomatoes, and they make it past the kitchen door without being eaten out of hand, I’ll make this soup. I ate it and loved it in Antequera, a small town in southern Spain, where I was informed that this is *not* gazpacho! Its a sort of salad in a bowl, thick and wonderful and a perfect summer meal. Cut the bread into very small pieces. Put sliced garlic and the rest of ingredients in a large bowl, and mash together until it holds together, adding the olive oil gradually. You can also make this in a blender or food processor but do not over-process. Add just enough tomato liquid to make it soup rather than paste. Refrigerate a few hours or overnight. Serve chilled but not right out of the fridge, topped with the egg and green pepper bits. Quick, cool, and good for you… ¡buen provecho/bon appetit!